Graphite is the stable form of carbon. Graphite is one of the softest; diamond is one of the hardest minerals known to man. Carbon is harder than graphite. For TEM and SEM applications, graphite is recommended. Carbon/graphite films are most usable in TEM and SEM due to its value characteristics: uniformity amorphous and high transparent to electron beams. Because of low molecular weight and their unique structure (graphite have a sheet like structure, where the atoms all lie in a plane), carbon/graphite films have excellent mechanical stability, and even film thickness is about 1-2 nm. Our carbon/graphite rods are CVP™ (Chemical Vapor Process) purity and spectrographic grade, grade 1, produced to ASTM tolerances or even tighter as well – we have a technical grade. The technical grade has a typical impurity level of 50ppm or greater. Technical grade may be used in applications of non critical SEM coating applications. Carbon Rods (graphite) with an impurity level of 2ppm or less with a maximum level element of each of 1 ppm. These rods are ideal for all TEM, SEM and all other critical applications. To make your work easier we invite you to order our pre-sharpened rods. All of our line of Pre Sharpened Carbon Rods are made from our Spectroscopically Pure Carbon Graphite. Sharpens either ¼ inch or ⅛ inch rods. 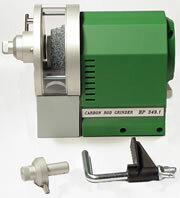 Simply insert the blunt carbon rod into the collet and push button on the side of housing. 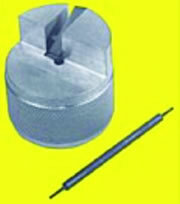 Rotate collet to produce 1 mm diameter tip in about three to four seconds. This sharpener produces straight sided tips. To make pencil form rods, use a regular pencil sharpener. Comes complete with brass adjustment tool.